We all know that saying, but no one can likely understand it quite like Meghan Markle. Ever since her relationship with Prince Harry was officially announced, the spotlight and scrutiny on the Duchess of Sussex, who is pregnant with the couple's first child, has yet to waver. If anything, the unwarranted criticism has grown louder, as the media continues to pit her against sister-in-law Kate Middleton Outlets claimed the wives were destroying the relationship between Prince Harry and Prince William, and TLC even dedicated an entire special, Kate vs. Meghan: Princesses At War, to the alleged feud. Not helping matters? The actions of her own family members, as her father Thomas Markle and her half-sister Samantha Markle have consistently spoken negatively about her, her husband and the royal family to the press. In an attempt to put an end to the "the global bullying" they were watching their friend endure, five of Meghan's closest companions, who chose not to reveal their names in order to protect their private relationships with the retired actress, spoke their truth to People magazine for their cover story. They also addressed her complicated relationship with her father, revealing the lengths Meghan had gone to in an attempt to repair it as he continued to go to the media, something she pleaded with him not to do in a heartfelt letter. So, naturally, Thomas shared that letter with the press, allowing the Mail to publish the alleged handwritten five-page note...engaging in the very behavior his daughter had asked him not to do. And that is when George Clooney, a close friend of the couple, finally had enough. Here's how Meghan's famous friends, including Serena Williams and Priyanka Chopra, are rallying behind her, both in public and privately, since she became the most famous woman in the world. How They Met: The Oscar winner and Prince Harry have been friends for a few years after meeting via their philanthropic endeavors and really connected at a private charity function in the UK, a palace source once revealed to E! News. It was also around the same time that Harry first met Meghan, eventually leading to double dates with George's wife. "When he started getting serious with Meghan, Harry introduced her to George and Amal," the palace source said, "and the couple quickly started hanging out regularly." That included frequent dinners in London and weekends spent at the Clooney's $25 million Berkshire mansion, with the insider explaining, "They all have a lot in common. so it just clicked as a four." While it was the men who were initially friends, Amal and Meghan clicked immediately, with the human rights lawyer becoming a "confidante" for Meghan, especially when she was relocating from Toronto to the U.K. "Amal and Meghan are much more friendly with each other and talk more regularly than George and Harry do," an insider revealed to us. "They have become really close friends." And that includes sharing a hairstylist, with their main mane man Miguel Martin Perez revealing to U.K.'s The Mail, "Amal put Meghan and me together when she moved here. I do her color, her cut and her styling." 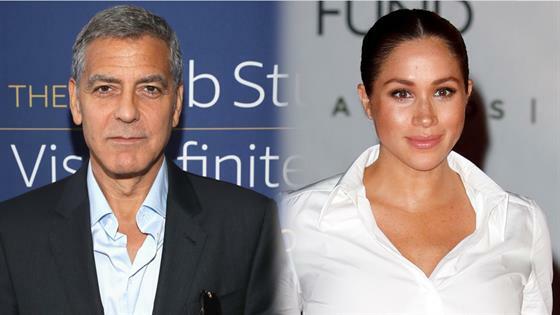 While Clooney has usually kept pretty mum about his friendship with the royal couple, he spoke out about the media's treatment of Meghan while promoting his Hulu show, Catch-22, referencing Princess Diana. "I do want to say, they're just chasing Meghan Markle everywhere, she's been pursued and vilified," Clooney said, according to Who. "She's a woman who is seven months pregnant and she has been pursued and vilified and chased in the same way that Diana was and its history repeating itself." He continued, "We've seen how that ends. I can't tell you how frustrating that is, just seeing them broadcast a letter from a daughter to a father, she's getting a raw deal there and I think it's irresponsible and I'm surprised by that." And even before his loud and clear public message of defense, Clooney went to extreme lengths to help the couple's need for privacy when they visited the couple and their twins at their Lake Como estate in August 2018. George actually dispatched his private plane and an unmarked motorcade to ferry the Duke and Duchess of Sussex to Italy for three days of catered dinners al fresco, lounging by the pool, playing with Alexander and Ella, and basketball games for the men in total privacy. It is fitting that Meghan met the tennis superstar through athletics as the friends hit it off when they both competed in DirecTV's Celebrity Beach Bowl together in February 2014. On her now-defunct lifestyle blog The Tig, Meghan revealed, "We hit it off immediately, taking pictures, laughing through the flag football game we were both playing in, and chatting not about tennis or acting, but about all the good old fashioned girl stuff. So began our friendship." "We are both the same age, have a penchant for hot sauces, and adore fashion, but what connects us more than those things is perhaps our belief in exceeding expectations—our endless ambition," she added. That friendship also included supporting each other's endeavors (Serena even wrote a few guest columns on The Tig! ), both privately and on social media. "She quickly became a confidante I would text when I was traveling, the friend I would rally around for her tennis matches," Meghan wrote on her blog, "and the down to earth chick I was able to grab lunch with just a couple weeks ago in Toronto." While she hasn't been able to attend as many matches lately, Meghan has shown her support for Serena in other ways, most notably wearing pieces from Serena's clothing line to major events, including one of her first public outings after announcing she was expecting her first child. "We had sent stuff to her a while ago, so we were excited to see it," Serena told Marie Claire of seeing the photos. "I've known her for years, and it's cool to see your friend help you out without even trying." She continued, "I was like, ‘Meghan, thanks!' And she was like, ‘Why are you thanking me? We're friends!'" While People's cover story featured five anonymous sources close to Meghan speaking out in her defense, Serena hinted that she may be one of them soon after the magazine was released. That same day, Serena posted a photo on Twitter of drinking from a mug, with the cheeky (and possibly telling) caption, "Sips tea." Aside from that cryptic message, Serena, who welcomed her daughter, Alexis Olympia Ohanian Jr., in September 2017, has recently been talking about how "nice" Meghan is, almost to a fault. "I'm like, 'How are you?' and she's like, ‘No, how are you?' and I'm like, 'You're so sweet, but I'm really asking—how are YOU?'" she told People in December 2018. "I'm like, 'Meghan, stop being so nice…you're the pregnant one, aren't you supposed to have hormones, why are you so sweet?' But that's always been her." That is consistent with the advice Serena revealed she gave Meghan when it came to dealing with the racist and sexist media coverage and online comments after her romance with Prince Harry went public, something Serena has dealt with her entire career. "I told her, 'You've got to be who you are, Meghan. You can't hide,'" she shared in Vanity Fair's 2017 cover story. And in September 2018, after her big argument with an umpire at the U.S. Open and Meghan's ongoing drama with her family were two stories dominating headlines around the world, Serena revealed to The Project's Lisa Wilkinson, "We have known each other for a long time, but we really, kind of, are relying on each other a lot recently." Priyanka and Meghan met at the ELLE Women in Television Event in 2015 and immediately formed a connection. "Meghan and I sort of just got on really well," the Quantico star recalled to Jimmy Fallon of their introduction that night. "And we were both filming in Canada at the same time. And we just met, and chatted." After becoming fast friends, Meghan described the India native as "unbelievable" in an interview with Press Trust of India (per India West), and revealed Priyanka was a fan of her show. "She has become a really good friend. ELLE Magazine in the U.S. hosted a dinner celebrating Women in TV, and we met that night—turns out that she really likes Suits." Aside from their shared love for Indian rice dish biryani, Priyanka told Jenny McCarthy they bonded over more than just food and styles, saying, "She's always been someone who's so just aware and interested in the world. That's what we bonded on—was how much we feel like we contribute to that as public people." But the Isn't It Romantic star tried to downplay their connection (and talk of her friend's love life) when she visited The Wendy Williams Show in 2017, telling the nosy host she wasn't even sure she'd the guest list for the wedding, let along be considered for a bridesmaid role. And when Priyanka and Nick Jonas first got engaged, the couple took a secret trip to London for her new fiancé to meet her best friend and Harry, spending time at the royal couple's country home. A source told E! News Nick earned Meghan's seal of approval, revealing she was "very excited" for the betrothed pair. "Everyone is very happy and they are definitely a great match." Given her high-profile romance with her now-husband, Priyanka is well aware of the pressure that comes from being a famous couple, let alone the most famous couple in the world. "High profile relationships are so stressful anyway, like as a friend I wouldn't like to add on that at all," Priyanka told Wendy Williams in 2017, also correcting the host when she used "Prince Harry's girlfriend" to describe Meghan. Priyanka said, "Also, Meghan Markle: actress, Suits, her achievements." Priyanka was also quick to call out Vanity Fair for making the headline on their cover story on Meghan all about Prince Harry. "It would have been nice to write about her not just her boyfriend. I'm just saying. I mean, she's an actor, she's an activist, she's a philanthropist. I mean, she does so much more," she told ET. "It's just a little sexist. Look, I'm a feminist and I love boys, OK…The only thing I'm saying is that there needs to be a certain sense of equality where a woman is not just a plus-one, you know. It's nice to be your own identity, too." And when Meghan was chosen as one of Time's Most Influential People of 2018, Priyanka penned the piece, writing about her friend's empathy, kindness and compassion for the world. "More than anything else, Meghan is an important influencer in a world that needs strong public figures to respect and look up to," Priyanka said. "People the world can be inspired by. Meghan, standing shoulder to shoulder with Harry, will be a princess for the people." When appearing on Good Morning America in 2018, Janina gushed about her longtime friend. "When I met her, she was so effervescent and talented and clearly brilliant," she said. "She's just such a magnetic person." She also said Meghan was "incredibly blunt" and "she'll make you crack up." She also revealed how the twosome keep in touch despite the distance between them, sharing that they often "sit on FaceTime or Skype and we talk for hours—mostly about things that are intensely important to us." Before deleting her social media, Meghan had commemorated their friendship reaching a big milestone, according to Harper's Bazaar. "Oh how I love seeing my long time friend @janina," Markle reportedly wrote in 2016. "I just did the math — did we become friends 15 years ago?!? Whoa." During that time, the future Duchess of Sussex even inspired Janina to start her own lifestyle blog, AltFound, even though Meghan was "a self-proclaimed Luddite," according to her friend. "Over our almost 15 year friendship, I've watched Meghan's dedication to self-growth, and generosity," she wrote. "As she grew theTIG, she urged me to do the same, for my own voice." "I walked away feeling so confident that these two will put their combined power into the world for good," she said of the couple. "They did it apart. They've done it apart their entire lives. Imagine what they can do together." But she also expressed her hope for Harry and Meghan's future, saying, "I hope for as much privacy as possible. As much as the world will allow them, I hope for more. Truly." In Vanity Fair's cover story on Meghan, Abigail, who bonded with the former actress when they met at an audition over 10 years ago, was quick to gush about her friend, saying, "She's got warm elegance, though her style is hard to pin down. It's classy and timeless. When you're talking to her, you feel like you're the only person on the planet. And it's just wonderful to see her so in love." And ahead of the Royal Wedding, her former Suits co-star told Entertainment Tonight Prince Harry was "very lucky" to be marrying Meghan. "She's a trusted friend and one of the most glorious people I have ever met." She also revealed this fun fact about the BFFs:" "We were born on the same day, hours apart, in the same year!" When it's meant to be, it's meant to be. Abigail, who contributed to Meghan's The Tig on occasion, also revealed to People that her friendship with the fashionable royal had impacted her own style. "She has incredible taste, she has really influenced my fashion and taste," she said. "We have a lot of similarities in what we like." The Timeless star hasn't spoken about her friendship with Meghan very often, but when she does, she is quick to highlight the mom-to-be's charitable endeavors, not her much-covered love life. "That's where her heart is," she explained after revealing her wedding gift for the couple would be a donation to one of their charities. "I think they need nothing more and want for nothing, but also would just love for anybody pour out their hearts and wallets into the organizations that they're involved in." And in an interview with People, Abigail said, "Meghan Markle is one of the loveliest human beings on the planet, in the world. I'm just so excited that the world will get to experience her loveliness, and I really think that with her platform for charity and her fortitude—she's going to have a great moment to change the world. If anyone can do it, it can be her." Patrick and Meghan met on the set of their hit USA Network show Suits in 2011, with their characters, Mike and Rachel, going on to become one of the show's most beloved couples. In the season seven finale, the pair got married and rode off into the sunset. When Harry and Meghan's engagement was officially announced, Patrick, who is married to Pretty Little Liars star Troian Bellisario, congratulated the couple on Instagram. "Playing Meghan's television partner for the better part of a decade uniquely qualifies me to say this: Your Royal Highness, you are a lucky man and I know your long life together will be joyful, productive and hilarious," he wrote. Meghan's former onscreen suitor had to quickly adapt to his co-star's new normal when she began dating Prince Harry, and that included being more aware of what he was posting on social media. "I posted this old photo I had found of Meghan and I on set," he told Esquire of an Instagram post he put up in 2017 of Meghan kissing his cheek. "I went to bed, and woke up in the morning and realized 'Oh, yeah. I live in a world where you can't post things about Meghan.'" The response was immediate and intense, with Patrick explaining, "I had this onslaught of people retweeting the thing, people thinking it was a recent picture, and I just thought, 'What the hell is going on?' It was such an innocent moment of sentimentality that was twisted into something totally different. It made me feel like… why put myself through this? We're like brother and sister, it's not like it was lurid or anything." And in February 2018, Patrick took on the protective brother role when he called out a politician who had a racist comment about his friend on Twitter. "You're a sad and sick man with no sense of shame or class," he wrote to Paul Nehlen, who had allegedly shared a photo of Meghan and Prince Harry with the caption, "Honey, does this tie make my face look pale?" Patrick's response continued, "Get a life. And don't go anywhere near MM - she's got more power, strength, honor and compassion in her fingernail than you'll ever know in this lifetime. Way above your weight class." "We can just have so much fun together, and yet, I'll still find so much solace in her support," she once told Glamour. And if anyone deserves fun and support right now, it's the Duchess of Sussex.